I pledged to not vote for any candidate for public office who runs even a single negative campaign ad against an opponent. I'm telling y'all right now that the ballot I cast in 2008 had a lot of wide open empty spaces. But the candidates that I didn't vote for, it can't be said that they didn't earn that. Either because I believed they were not suitable for office on their own merits, or because they violated the terms of my vow. Look folks, seriously: if a candidate spends millions of dollars attacking his or her opponent instead of telling us "This is what I believe and this is how I want to serve you...", why should we trust them with our precious votes? Is a candidate more interested in being a public servant, or is a candidate more interested in the office, along with the power and influence that comes with it? How a person conducts himself or herself during a campaign - I believe anyway - indicates the character of that person when he or she gets elected. If a candidate can't run without running a vicious, nasty negative campaign attacking a candidate, then all that really tells me is that that candidate lacks the creativity, the vision, the leadership qualities to be in an elected position. I know something of what I speak. I've run for office before, once. I produced three TV commercials on my own. I designed my campaign's yard signs and newspaper ads. Nothing of that material was negative... and I came really close to landing election. Not only that but the campaign earned worldwide attention and praise, so don't even think about telling me that "being nice" won't work. I guess I just couldn't live with myself if I ran a campaign ad aimed at "the other guy". And I don't see how any other candidate could live with himself or herself either. We need candidates who will present themselves and what they believe in, nothing more and nothing less than that. If they can't be honest in that much, then they shouldn't be running, period. I have created a new Facebook group, Political Candidates Running Negative Ads WILL NOT Get My Vote. It is just what it sounds like: a group for those of us who have pledged to not vote for anyone who runs a negative ad attacking a fellow candidate. I know. Some will be saying "But Chris, this is only electing the incumbent! Who is in office is more important than how they play the game, the ads they run, the attacks they make!" I don't believe that. Because how they play "the game" demonstrates the kind of person that they will be when they get into office. "We have to do whatever we can to (throw Obama out, defeat Mitt Romney in the primary, etc.)!!" That's how it always starts. "Get the other guy." It is time for that to end. There has to be a beginning somewhere. Let it begin with us. Please keep in mind: This is NOT something I'm associated with or in opposition against any one political candidate or party. What this group is organized about is in regard to something that every political party... and too many politicians within each of them.... is guilty of perpetrating. 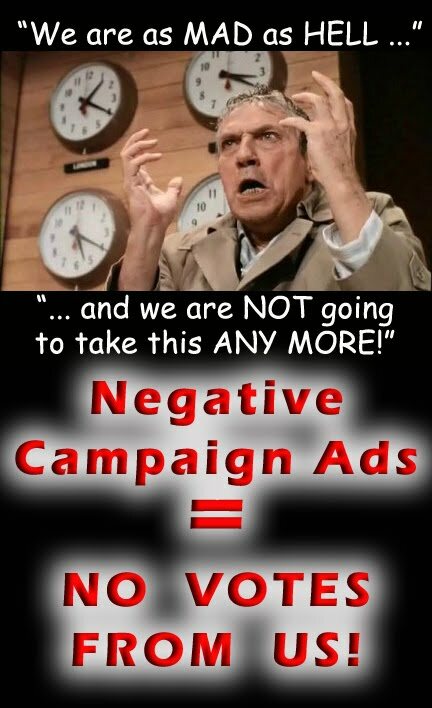 It's very simple: a candidate who runs even a single negative ad aimed at an opponent, DOES NOT DESERVE OUR VOTE. Any political candidate that does this only demonstrates that he or she is after the office for its power, NOT to serve We The People. Candidates should PROVE to us why THEY deserve enough of our trust to vote for them at the ballot box. Telling us not to vote for "the other guys because...", ain't gonna cut it anymore. I am fed up with candidates pulling this kind of crap. They are an insult to me, they are an insult to my community, and they are an insult to the United States of America. There will be no change for the better in American government until we, the PEOPLE, choose AGAINST the negativity, the anger, the blind hatred that is dominating our political process. Those who would exploit our baser instincts should be PUNISHED, not rewarded with elected office. I pledge that if ANY candidate produces and runs for broadcast, print or any other published media even one negative ad or phone call or whatever, then I will NOT vote for that candidate. Ever. And I sincerely invite you to pledge to do the same. Another losing endevor Chris? You lost your wife. You lost your mind. You lost your job. You lost election. You make loser movies. Your entire life is a loser. Give up. Anonymous #1... Don't you have anything better to do? Someone has an idea - a good one - and you have to attack him as a person??? That is REALLY low. I don't know who you are or if you even know Chris personally, but I know Chris VERY well (I'm his girlfriend). He is NOT a loser. He's gone through some hard times, but I'd say having survived it... that makes him a WINNER. Could YOU have come out standing after all that? I don't think I could've. If anyone should give up, that would be you... give up tearing people down! Insults and hateful comments don't get you anywhere in this world. I'd advise you to learn what kindness is and put it into practice. In the meantime, please find something better to do and leave Chris alone. Thanks. I agree with Kristen!!! You have no idea how much stronger of a person Chris become by talking to God to help him through all he has been through...Some people would have committed suicide if they have been through what my friend has been through...I know that I wouldn't have made it through. Thanks to friends like me, others, and his girlfriend Kristen to help pull him through...You mess with one you mess with all. Bro keep up the good work on this type posts people need to need to know the truth...whoever said this better know this guy has an army of angels backing him up. So you're not voting for Ron Paul then ? His PACs are all over Gingrich and Romney. "So you're not voting for Ron Paul then ? His PACs are all over Gingrich and Romney." I like Ron Paul. I have met him before. I think he would make a better President than anyone running as a Republican right now. But I have to be consistent with my vow. It's too much a thing of conscience. Bcause of that, I could not vote for Ron Paul right now. If any candidate turns away from negative campaigning, I would gladly reconsider voting for that candidate. I've been a reader of your blog for sometime now. I don't remember how I ended up here, but you hooked me in and I've been an avid reader since. I've watched and enjoyed your movie, and anything else you've posted, and I've seen you travel a rough road over the years. As a fellow brother in Christ, I've prayed for you in your hardships. You've had an amazing journey, and I'm glad to have been a follwer of it. I'm glad God brought Kristen into your life when you needed her. You have a gift with your writing, and I look forward to visiting your blog and finding something new everytime I'm online. Ignore the trolls, as I know you do, and keep up the great work. And I agree with you on the whole negative campaigning thing. Of course, I'm pretty much a political atheist myself, so I really don't know if I'll be voting for anyone this year. I may just do a write-in. At least my conscience will be clear. When it is from a person's body language is easy to understand symbols. They use body language to pretend do not know. This is why most of the male offenders easily gave away their guilt when faced with during the trial.